I am busy printing, cutting and packaging my personalized bookplates for friends, coworkers and family. I scan my drawing, format the drawing in Photoshop and then add "this book belongs to" with the names of my recipients. These bookplates are printed on 8.5" x 11" adhesive labels I purchase on Amazon. I like to use adhesive sheets that don't have any writing on the back. After the sheets are printed, I then cut them in uniform sizes and package them in little vellum paper pockets I cut and build myself. 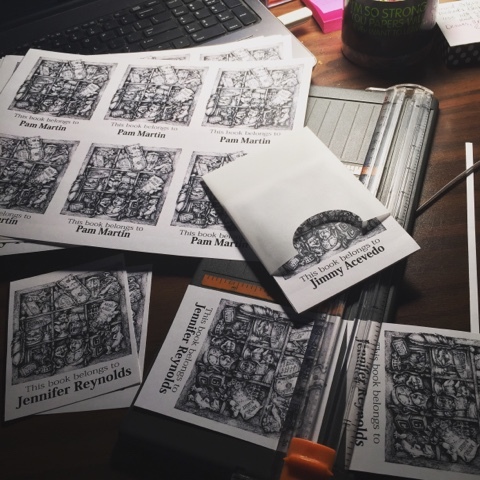 I like to include a small card in each pocket which explains the story behind the drawing and a little history of bookplates. I typically create my bookplates as Christmas gifts but this year I was so busy with commission artwork it just had to wait until now.